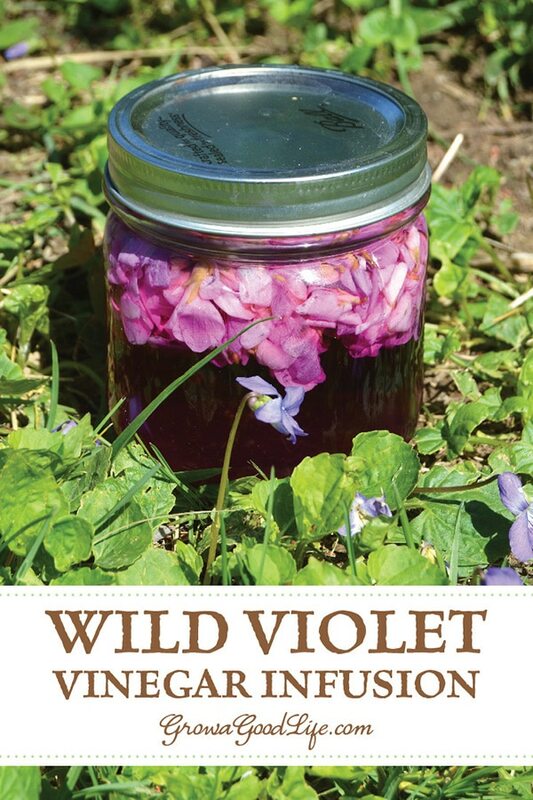 It is easy to make your own wild violet blossom vinegar. See how simple it is to infuse vinegar with a subtle violet sweetness and a purple flush of color. I know it is truly spring when the grass turns from brown to green, and I spot the first purple and yellow bursts of color of the wild violet and dandelion blossoms. While many view these as weeds, both are edible and have a long history of medicinal uses. The wild violets that grow in my yard are Viola sororia. It is generally known as common blue violet, hooded blue violet, and meadow violet. Viola sororia is also the state flower of Illinois, New Jersey, Rhode Island, and Wisconsin. I also have the white variation, viola sororia albiflora. There are over 500 species of wild and cultivated violets around the world. Viola sororia is common in lawns and woodlands in the eastern half of North America where they grow in partial shade and spread to sunnier areas by seed and underground rhizomes. Viola sororia grows in 4-6-inch clumps and has heart-shaped leaves. They bloom from April to June, and the flower colors range from a deep purple to white (Source: NPIN). Both the leaves and flowers of Viola sororia are edible and contain nutrients. 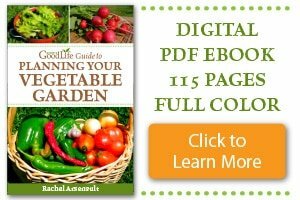 The blooms and leaves contain vitamin C, and the leaves are also high in vitamin A. A half-cup serving of leaves provides the same amount of vitamin C equal to four oranges and more than the minimum daily requirement of vitamin A (Source: Gibbons). The blooms and leaves of the wild violet have been used for centuries as syrups, teas, and infusions to treat bug bites, bronchitis, mild constipation, coughs and eczema (Source: Heatherley). 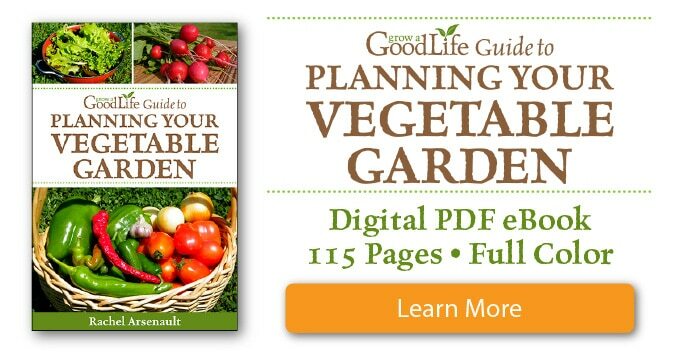 All edibles are fair game in my yard and I often snip a few violet leaves and flowers and toss them in salads. The leaves have a slightly peppery flavor that doesn’t overpower, and the texture is similar to other salad greens. 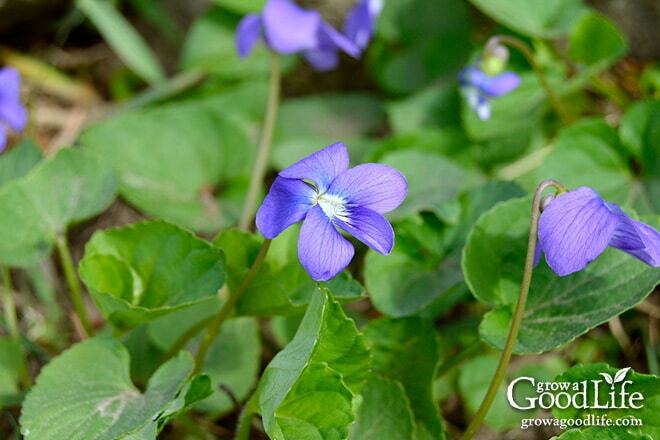 The violet blooms are mildly sweet and add a nice contrast of color to spring greens. 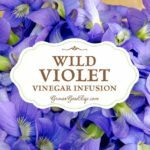 I love infusing the violet’s stunning purple color and light violet flavor in vinegar. A clear and mild-tasting vinegar works best for this flower because it doesn’t overpower the delicate violet blossom flavor or color. White wine, champagne, or rice vinegars are all very good choices. Step 1: Harvest the violet blossoms right before you make the wild violet vinegar. The blossoms don’t last long. Rinse the violets in cool water and spread them out on a clean kitchen towel to dry. Step 2: Pack the violets loosely into a clean glass pint jar. Set aside. Step 3: Add the vinegar to a small saucepan. Bring to a simmer over medium-low heat. 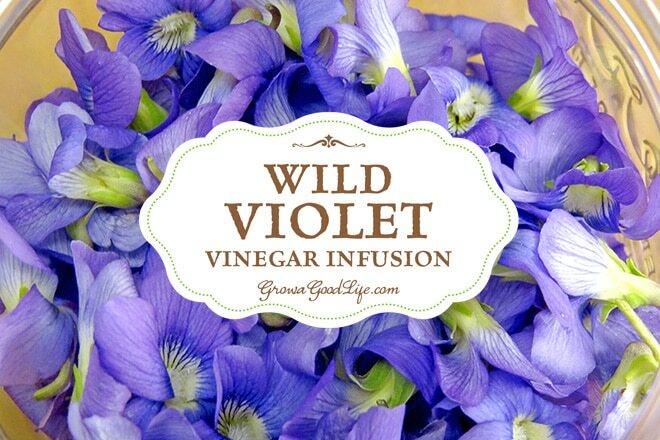 Pour the warmed vinegar into the jar over the violets leaving about a 1-inch space at the top of the jar. Step 4: Cover and store the jar in a dark, cool location for at least 2 days or up to a week. Step 5: Once the vinegar has turned a lovely shade of violet, strain out the blossoms and store the violet blossom vinegar in a clean glass jar or bottle. Compost the spent blossoms. Step 6: Wild violet infused vinegar can be used to make delicious salad dressing for spring vegetables and as a marinade for meats or grilled vegetables. Rinse the violets in cool water and spread them out on a clean kitchen towel to dry. 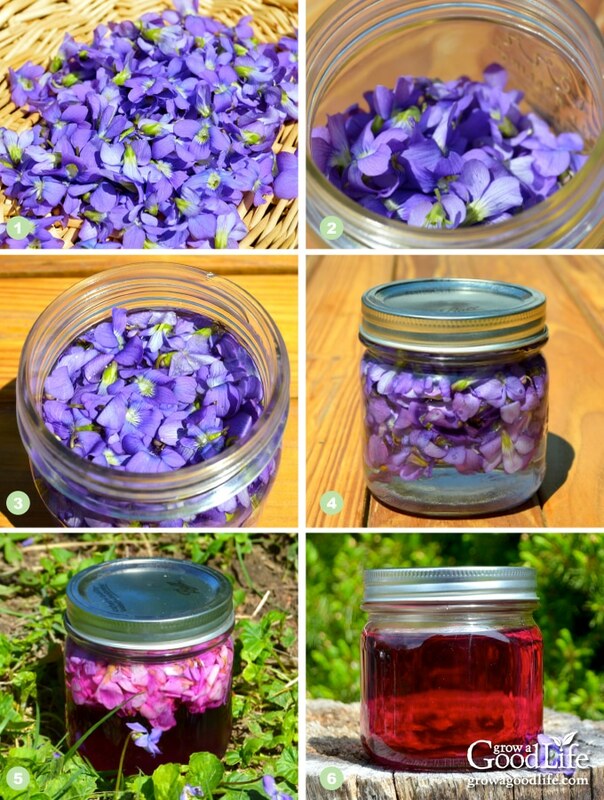 Loosely pack the violets into a clean glass pint jar. Set aside. In a small saucepan, warm vinegar over medium-low heat to a simmer (not boiling). Turn off heat. 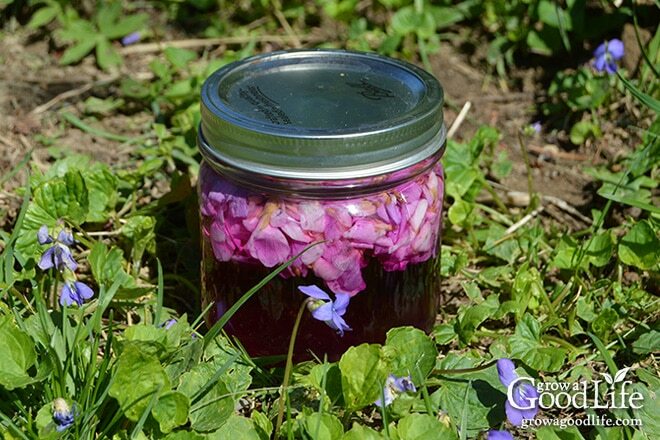 Carefully pour warm vinegar over the violets leaving about a 1-inch space at the top of the jar. Cover the jar and store in a dark, cool location for at least 2 days or up to a week. You should see some color right away, but the longer you infuse the vinegar, the darker the color. Once the vinegar has turned a lovely shade of violet, strain out the blossoms and store the violet blossom vinegar in a clean glass jar or bottle. Compost the spent blossoms. Gibbons, Euell. Stalking the Healthful Herbs. Putney, VT: A.C. Hood, 1989. 63. Print. Heatherley, Ana Nez. Healing Plants: A Medicinal Guide to Native North American Plants and Herbs. New York, NY: Lyons & Burford, 1998. 218. Print. “NPIN: Native Plant Database.” Lady Bird Johnson Wildflower Center. Web. 09 May 2016. I am not a doctor, and the statements on this website have not been evaluated by the FDA. Never eat flowers or plants unless you are certain of their identification, and that you are not allergic to them. It is recommended that you consult your medical care provider or herbalist prior taking or relying upon any herbal product. Always seek advice from a professional before using a plant medicinally. Oh, that’s lovely! It never occurred to me to use violets to flavor vinegar & what a stunning colour. The color is really stunning. It would make a great hostess gift too.